For years, the buzz around antioxidants has been constant. This essential nutrient plays a substantial role in homeostasis, or balance, of the human body. But, how exactly do they help the human body? For obvious reasons, oxygen is one of the many elements that keep the human race thriving. Without it, our Earth would be uninhabitable, and our blood unable to carry energy to our cells. The strengths and benefits of oxygen are clear, however, it also has the ability to do harm to the body if present in abundance. An overabundance of oxygen in our cells disrupts the homeostasis of the body, leading to the creation of free radicals, or unbalanced molecules (specifically molecules missing a single electron). While free radicals occur naturally in the body, they are also a result of some lifestyle choices like smoking. Environmental factors, such as the presence of pesticides or pollution in the air, are also common sources of free radicals. Oxidative stress is the result of a significant amount of free radicals in your body. Not only does oxidative stress disrupt the body’s homeostasis, but is believed to be a factor in premature aging and a variety of diseases and other conditions. 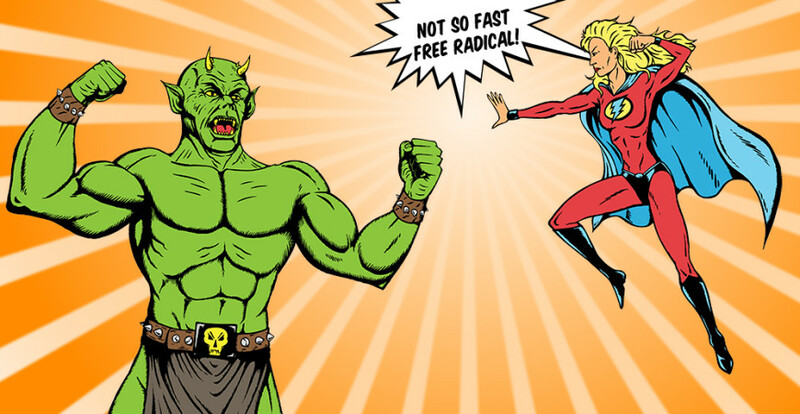 Luckily, antioxidants combat the creation of free radicals. On a molecular level, antioxidants restore homeostasis by providing the unbalanced molecules with a new electron. The body is able to produce antioxidants naturally, however, they are also present in foods that we consume. Due to the numerous lifestyle and environmental factors that contribute to the overabundance of free radicals, the introduction of external sources of antioxidants is the answer to the imbalance which occurs in the human body; the essential nutrient transforms problematic free radicals into healthy cells, aiding the correct working order of the human body—or—homeostasis.